Been a while since I’ve done one of these. Let’s give it a whirl! 10 Things On Your Mind Right Now. My susceptibility to viruses and infections. I’m tired and fed-up with being ill all the time. 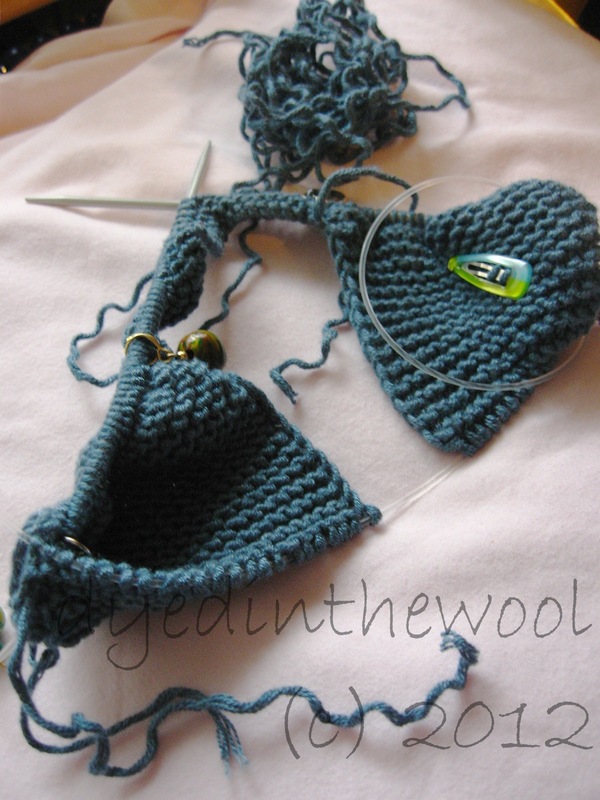 Giftmas knitting/crafting/baking – will I get everything done in time? Probable outcome; unlikely! 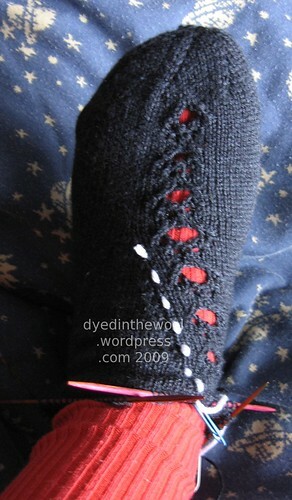 Related to 2; will I manage to finish my mum’s cardigan for NaKniSweMo? Will I ever see my brother again now he’s emigrated? I’d wanted to go into Manchester before Christmas/new year but it doesn’t seem likely. I’m upset about that, but not as upset as I’d thought I’d be. I’m trying to learn to be accepting of situations which I have no control over. Wishing I could be more selfish and do more things for myself instead of others. I wasn’t warming to series 2 of Homeland until the most recent episode. It just got very good again. I’m missing being able to watch/listen to my favourite things; horror, suspense, sci-fi, and fantasy fiction and science/history documentaries because some aspects of all of these things trigger panic in me now. Because I’m catching up on stuff.. I can wiggle my ears (independently of each other) up and down; a skill I inherited from my father’s father. I have a coffee cup and a tea cup and tea should never be put in the coffee cup or vice verse – they taste wrong. I am right handed but pour the kettle, the milk, etc left handed. If I pour right handed I judge the distance wrong and spill. Tell six quirky yet boring, unspectacular details about yourself. Tag six other bloggers by linking to them. The throat is better (thanks for the good wishes) but I’m still feeling a bit dopey (who’d notice) and my hearing is a bit down (huh? Pardon?). 1. My uncle once had three weddings (one marriage) to the same woman. 2. Never in my life have I been outside Europe. 3. When I was five I was probably the happiest I have ever been. 4. High school was a bit of a Curate’s Egg. 5. I will never rule anything in or out. 6. Once I met Sir Cyril Smith. 7. There’s this boy I know in Halifax whom I’m technically still going out with (we were 7 and never actually broke up!). 8. Once, at a bar I had to stop my Grandmother from embarrassing me. Again. 9. By noon, 90% of the time, I’m awake. 10. 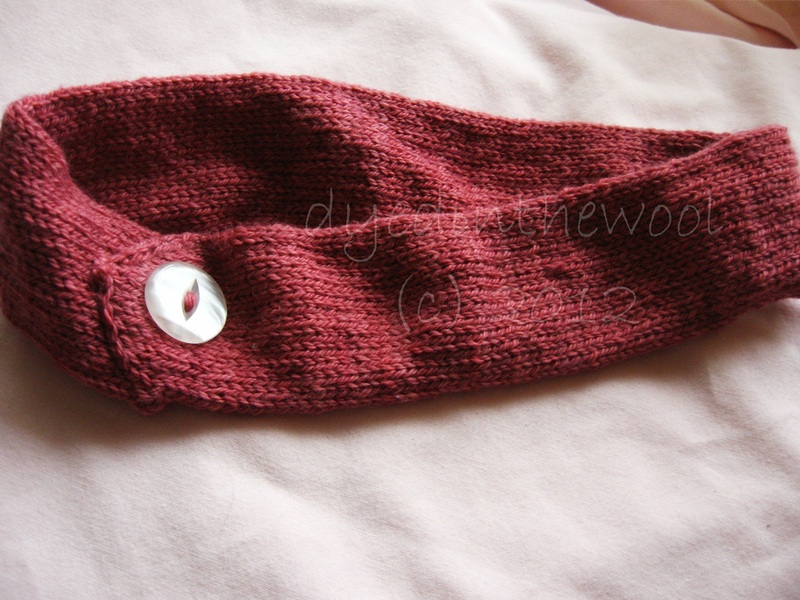 Last night I watched Saw 3 and knit a swatch (at the same time). 11. If only I had some good health. 12. Next time I go to church it will probably be for a funeral (again). 13. What worries me most is the health and well being of my parents. 14. When I turn my head left I get a pain in a chest muscle. 15. When I turn my head right I get the same pain in a chest muscle! 16. You know I’m lying if I tell you I will vote for the BNP. 17. What I miss most about the Eighties is good health. 18. If I were a character in Shakespeare I’d be one of the ones in a comedy who has a happy ending! 19. By this time next year I doubt much will have changed. 20. A better name for me would be Mrs. Zaphod Beeblebrox. 21. I have a hard time understanding intolerant and disrespectful people. 22. If I ever go back to school, I’ll be doing my Masters degree in Science and Society. 23. You know I like you if I’m willing to touch you. 24. If I ever won an award, the first person I would thank would be my mum. 25. Take my advice: always wear sunscreen. 26. My ideal breakfast starts at 11 am and finishes at about 2 pm! 27. A song I love but do not have is: “Paint it Black” by the Rolling Stones. 28. If you visit my hometown, I suggest that you’ve taken a wrong turning and you meant to go somewhere nice. 29. Why won’t people shut the hell up at 3 am and go to sleep like normal folk? 30. If you spend a night at my house be prepared for noisy neighbours. 31. I’d stop my wedding for flood, famine, a better offer? 32. The world could do without ignorance. 33. I’d rather lick the belly of a cockroach than watch Big Brother. 34. My favorite blondie is Debbie Harry. 35. Paper clips are more useful than a poke in the eye with a sharp stick? 36. If I do anything well it’ll be a miracle! 37. I can’t help but I probably know someone who can. 38. I usually cry at photos, film and stories from the Holocaust. 39. My advice to my nephew/niece: don’t you dare be conceived yet, I’m too young to be an auntie. 40. 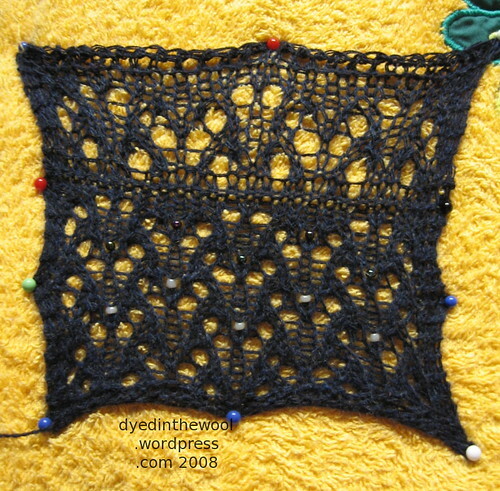 And by the way, I did the swatch for the Mystery Stole4. 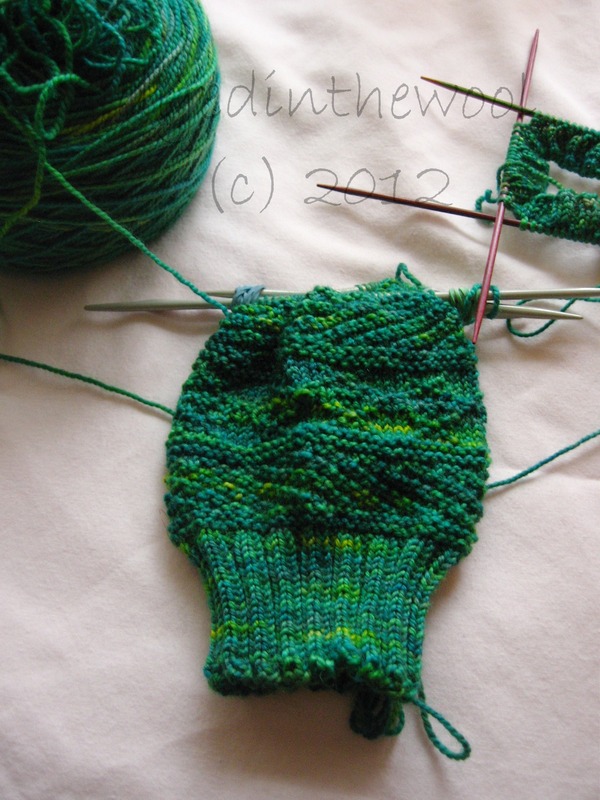 The upper part of the swatch is one repeat worked on a 5 mm needles, the lower are three repeats worked on a 4 mm needle. I much prefer the latter. Although they don’t really show up well on camera, I’m favouring the iridescent (dark) beads over the pearlescent (light) beads. If the first clue contains beads, I’ll still wait to see some finished clues before I start. I want to see how prominent the beads need to be to work in the pattern. My gut instinct is to choose the darker beads not solely based on their look, but also because I can use the crochet hook to put them on the yarn. The holes in the pale beads are too small to use the hook and the dental floss method takes me at least twice as long to do! 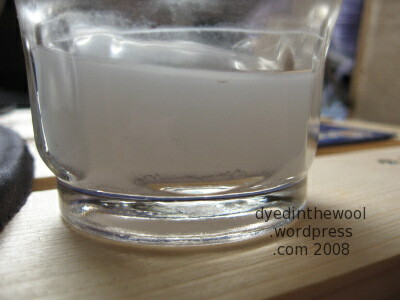 It stained the towel I was blocking it on, too. I need to remember that! Please leave a one-word comment that you think best describes me — it can only be one word long. Then copy and paste this into your blog so that I may leave a word about you. 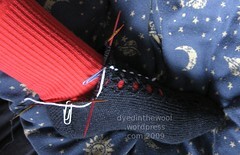 After vowing not to do memes unless they contained knitting, I thought of this one when it was cold, dark and snowing! These are the things I do, watch or wear when it’s cold or I’m feeling down. The Three Amigos with Chevy Chase, Steve Martin and Martin Short. It’s so funny it hurts. Either that, or X-Men or X-Men2! Or the Fifth Element. Star Trek (any series) or Stargate SG-1 – really, what else would I pick? I could say chocolate, but that’s too easy. My absolute favourite comfort food is peanut butter egg noodles. Yum! Yoga pants and the largest jumper I can find! Tagging? Anyone who wants it. Just copy and paste the following text, fill in with your own guilty pleasures, post it and then link back to this post. Thank you!